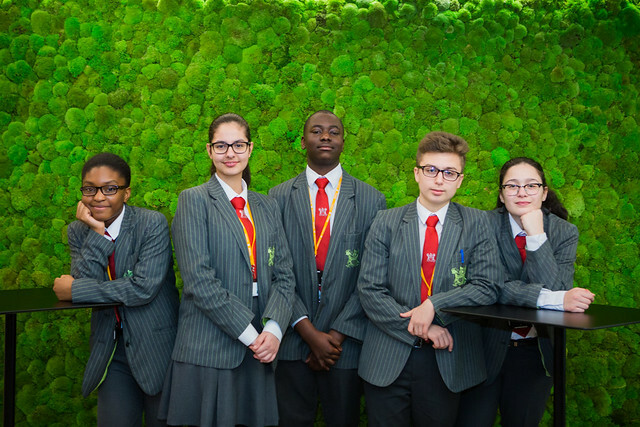 A team of young entrepreneurs from Skinners’ Academy in Hackney has won the London Regional Final of the 2017 Enterprise Challenge competition. Team YouTe@ch from Skinners’ Academy beat stiff competition from teams from Eden Girls’ School in Waltham Forest, London Enterprise Academy in Whitechapel, Southfields Academy in Wandsworth and St Paul’s Way Trust School in Tower Hamlets. Their winning idea centred on an exclusive video sharing platform, YouTe@ch, reserved exclusively for schools and aimed at nurturing engagement around revision, careers and talent. All finalists had beaten hundreds of students from other schools across the region to reach the final. The competing teams pitched their ideas in a Dragons’ Den style event to a prestigious panel of judges, including: Saker Nusseibeh, CEO of Hermes Investment Management; Rowland Gee, Director of Retail Success Ltd; Nick Howe, Regional Enterprise Manager of RBS (Natwest); Haseena Lockhat, Consultant Clinical Psychologist and Chairman of the Mosaic West Midlands; and Roxana Mohammadian CEO of Paros Capital. Team YouTe@ch will now progress to the Enterprise Challenge Grand Final in London on 17th May where they will compete against winning schools from the North West, West Midlands, South East, Yorkshire and Scotland for the chance to become national champions.